Jason(J-Mann) is a full time musician in Southern California who has played numerous corporate, private, wedding and casino engagements-as well as having played in Nashville with his full band. Just recently, he opened for Al Stewart at The Coach House in San Juan Capistrano and the 80's metal band Stryper. 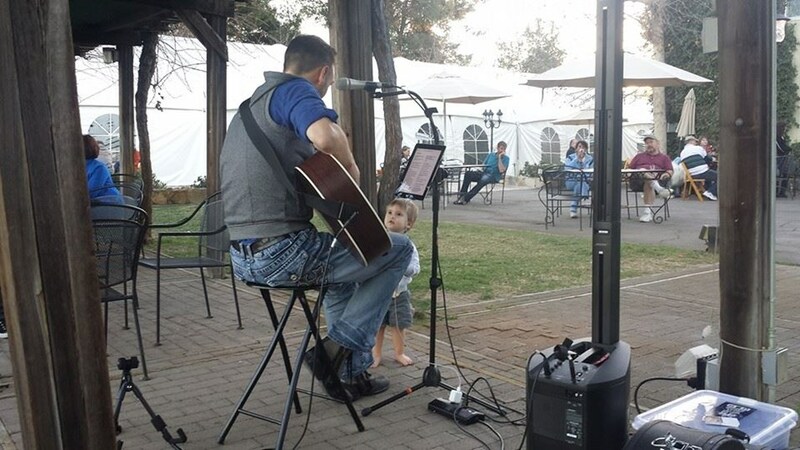 He can play anything from conversation-friendly background music, to uptempo crowd pleasing sing-alongs. 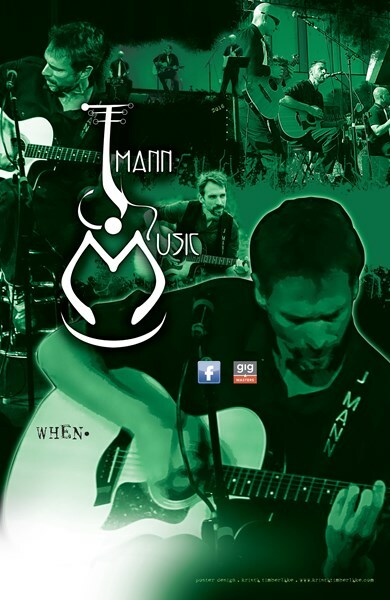 J-Mann Music can play any event as a solo, duo or trio act and plays between 150-200 engagements per year. Everything from corporate ribbon cuttings with the Mayor of San Diego to local parties to national anthem events. Jason will take you through your entire planning process, streamlining your entertainment experience and making your important day one to remember! What are people saying about J-Mann Music? He was excellent! Professional, talented, and he made our wedding that much more beautiful. Emailing with J-Mann prior to our event and sharing ideas was super easy and he always got back to us quickly. He had lots of additional information about our venue that we hadn't realized and that really helped us out. Super nice guy, I would highly recommend to anyone! Jmann rocked it. What a perfect choice to play at our rehearsal dinner. I couldn't be happier we loved it so much we had to have him stay longer! Thanks J Mann!!! Jason did a great job at our baby shower event. Talented musician with a great personality. Exactly what we needed to set the mood right at the party. Will definitely have him again for our future events. Great music, on time, did exactly what was requested, crowd enjoyed. Thank you! Jason and his band sang and MC'ed at our office grand opening event of around 200 people. They were extremely talented and easy to work with. Jason has a Jason Mraz sounding voice that was perfect in this fun yet businesslike setting. We sent him a script the night before to MC and he did an amazing job. We will definitely be hiring him for future events. "Jason was amazing at our event today which was a surprise party with over 30 people. He sounded amazing, he interacted with our guests & asked if they liked his song selections & if they had any requests. I love that he not only interacted with our guests, but he also remembered their names and addressed them by name at the end of the night. We didnt have a shaded area for him, but that was ok - he made sure he was covered. He played continuously, only to take short (emphasis on short) water breaks. I highly recommend his services & will recommend him to everyone I know. Thanks Jason!!" "Jason was superb in every way! He was communicative, professional letting me know his arrival time so I wasn't worried (as sometimes it can be stressful hosting events and making sure the vendors are actually going to show up) Then, when Jason started to play his music- wow! What a talent! He understood the vibe of the environment and was amazing! 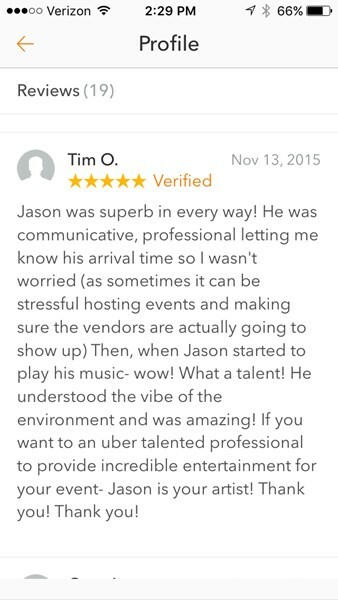 If you want to an uber talented professional to provide incredible entertainment for your event- Jason is your artist! Thank you! Thank you!" Please feel free to look up J-Mann music on Facebook, search /jmannmusic, for a listing of his current public and private events. Jason is endorsed by Furch/Stonebridge Guitars, Tsunami Cables, SIT Strings and Steve Clayton, Inc.
J Mann is friendly, professional, so talented and all around fantastic to work with! Highly recommend! Jason Mann was the perfect musician for an afternoon private farewell event at a local restaurant. His repertoire is impressive, and his guitar and vocal talent were excellent. The best of the best. You will NOT be disappointed! A...mazing talent voice professional personable and handsome! We loved him as did the guests. Jason was GREAT! Professional, on time, very responsive to questions.He even checked in with me the morning of the event which was AWESOME because I had so much on my mind and so much to do. That one little text took a load of worry off my shoulders. The attendees on our dinner cruise where Jason played said they really enjoyed his music. We absolutely loved our music at our sons engagement party. J-Mann was amazing- the songs, his voice, everything about it really made this night so special. We want to have more parties so we can have him again. Jason was perfect for the event. Showed up on time, was ready to start when he was supposed to, communicated well and timely, and the day of the event let me know his arriving progress. His live music was even better than his online music for listening to his talent and musical range. Would give him a 4 out of 5 on price say that only because on the high end of what I thought was reasonable for 1.5 hours, but given he wasn't local, paying for travel time was not out of the ordinary. Jason was prompt and professional and is extremely talented! He played exactly what we asked for and did such a great job adding the perfect upbeat vibe to our Celebration of Life. We will keep him in mind for future events and would recommend to everyone! Jason was great for our corporate event! He had a wonderful mix of songs and put his own twist on it. It was a great addition to our event. Jason and the crew were kind and professional from the time they came, and music was very good. Thoroughly enjoyed and appreciated by everyone in attendance. Would definitely recommend them for your events. Please note J-Mann Music will also travel to Poway, Rancho Santa Fe, Escondido, Del Mar, San Marcos, Santee, Solana Beach, Cardiff By The Sea, La Jolla, Encinitas, El Cajon, Lakeside, Ramona, La Mesa, Carlsbad, Vista, Lemon Grove, Spring Valley, Oceanside, Valley Center, Alpine, Coronado, Bonsall, Lincoln Acres, National City, Bonita, San Luis Rey, Chula Vista, Pauma Valley, Jamul.